Named the “grapefruit” because it grows in clusters similar to grapes, nothing says summer quite like this citrus fruit. In fact, its Latin name, Citrus paradisi, translates to citrus paradise. Grapefruit were first noted on the island of Barbados in 1750, where it was thought to be a natural crossbreed between the orange and pomelo. By 1880, grapefruit had become a major crop in Florida. 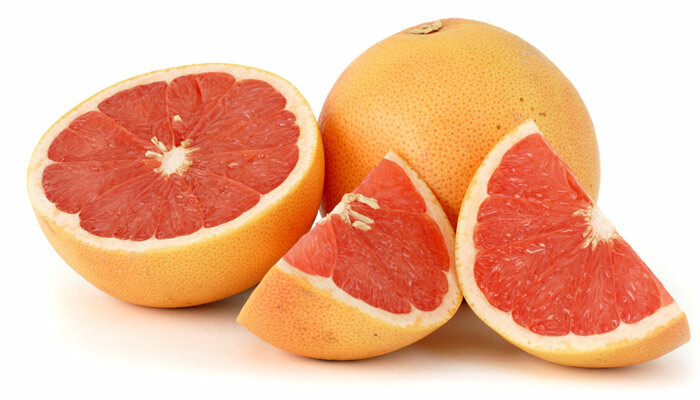 Grapefruit are a good source of flavonoids, water-soluble fiber, potassium, vitamin C, and folic acid. A 3½ ounce serving of grapefruit, approximately half of an average red or pink grape fruit is only 42 calories. Studies have shown pectin found in grapefruit to be effective at lowering cholesterol, resulting in a decreased risk for heart disease. Grapefruit contains the carotene lycopene, a photochemical that helps battle heart disease, cancer, and macular degeneration. Grapefruit also contains D-limonene, which helps the liver rid the body of toxic chemicals responsible for tumor formation. Grapefruit are a great addition to any meal, and are especially refreshing during the warmer months. Try eating half a grapefruit with your breakfast, or even having a glass of grapefruit juice to help wake you wake you up in the morning. Brighten up a green or fruit salad by adding chunks of grapefruit. Love to grill during the summer? Try grilling halves of grapefruit sprinkled with maple syrup and cinnamon. What is your favorite way to enjoy grapefruit? Comment and let me know!